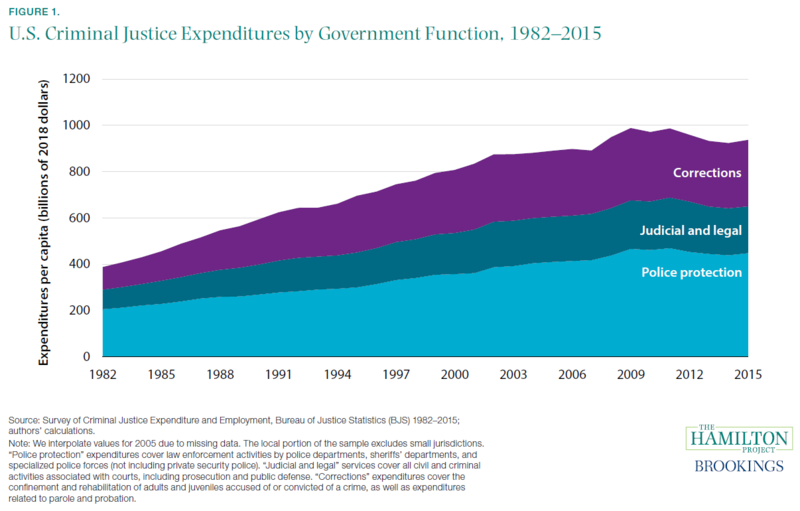 Fact 1: Expenditures on police, corrections, and the judiciary have increased over time. The United States spends large and growing sums on criminal justice. In 1982, real per capita spending on law enforcement was $205; when added to spending of $98 and $84 on corrections and the judicial system, respectively, the United States spent roughly $388 per capita on criminal justice in that year. Since then, all three of those expenditures have grown dramatically, with corrections expenditures growing especially quickly through the end of the 20th century, as shown in figure 1. Corrections spending has grown only 6 percent since 2000, when the incarceration rate leveled off and eventually began to decline, but total criminal justice spending rose 16 percent to its 2015 level of $937 per capita. Corrections spending—which includes not only incarceration but also parole, probation, and rehabilitation—cost the country fully $92 billion in 2015. Incarceration is particularly expensive, constituting 85.7 percent of corrections spending at the state level (BJS 1982–2015). These growing expenditures have put pressure on state and local budgets. Unsurprisingly, they coincide with an increasing tendency to use monetary sanctions to fund the criminal justice system (Bannon, Nagrecha, and Diller 2010). Fact 2: The ratio of sanction revenues to police and judicial expenditures is substantial in many jurisdictions. The collections calculated in figure 2 include restitution to crime victims, which are not available to fund law enforcement or judicial expenditures. However, figure 2 also excludes important sources of criminal justice revenues like those from the sale of confiscated property or court fees (e.g., booking or supervision fees), which suggests that this is an underestimate of criminal justice revenues. A core problem with such a high share of revenue coming from fines and fees is that it can generate incentives that distort criminal justice policy or behavior. For example, towns with budget problems may increase enforcement of traffic violations, or they may generate and enforce new laws specifically to generate revenue (Makowsky and Stratmann 2009). One study suggests that police departments that focus on revenue generation do so at the expense of their public safety duties, finding that a 1 percent increase in the share of revenues from fees, fines, and forfeitures is associated with a 3.7 percentage point decrease in the violent crime clearance rate (Goldstein, Sances, and You 2018). In a Hamilton Project proposal, Michael Makowsky (2019) describes research that links fines, fees, and other monetary sanctions to law enforcement activities, and proposes reforms that would realign law enforcement with its traditional public safety objectives. Fact 3: Courts assessed monetary sanctions for two-thirds of prison inmates. Criminal justice debt typically comprises several types of monetary sanctions that accumulate on top of one another. In addition to fines and court costs, individuals who come into contact with the criminal justice system might also need to pay surcharges, penalties for late payments, and interest (Harris et al. 2017). Criminal justice debt is persistent: a formerly incarcerated man who pays $100 a month toward his debt is likely to have substantial legal debt even after 10 years (Harris, Evans, and Beckett 2010). Fees, fines, and restitution have all become more common over time. From 1991 to 2004, the fraction of inmates with any monetary sanction rose from 25 to 66 percent. This escalation was driven in large measure by the increase in the fraction of inmates subject to fees (“Court costs” in figure 3a), which rose from roughly one in ten inmates to more than half of inmates (Harris, Evans, and Beckett 2010). Court fees have been an important driver of the increase over time. As criminal administrative costs increased, 48 states have increased civil and/or criminal fees since 2010 (NPR 2014). With the growth of fees has come additional burdens for individuals. For example, 43 states and the District of Columbia allow courts to charge for the use of a public defender, 44 states allow courts to charge supervision fees for probation, and 9 states allow courts to charge fees for English translators and interpreters (Appleman 2016; NPR 2014). Fact 4: More than half of all individuals with a felony conviction in Alabama owe more than $5,000 each in criminal justice debt. Among those convicted of felonies in Alabama, only a quarter were assessed sanctions lower than $2,500; more than half of inmates were assessed roughly $5,000 or more in sanctions. Given that the typical household has just $4,000 in liquid savings and the poorest quintile of households have less than $1,200 in total financial assets, these figures represent a substantial burden for many households (Liu, Nunn, and Shambaugh 2018). State policies often amplify the economic effects of these burdens. Unpaid criminal justice debt can result in revocation of a driver’s license, which in turn limits labor market opportunities (Salas and Ciolfi 2017) and risks further criminal charges for these individuals—75 percent of whom continue to drive on a suspended license (Marsh 2017). Similarly, occupational licenses—required for employment in many professions from cosmetology to architecture—can be revoked or withheld because of criminal convictions (Avery, Emsellem, and Hernandez 2018) or unpaid debt (Criminal Justice Policy Program 2016). There is also evidence that assessing monetary sanctions on juvenile offenders and their families increases the likelihood of recidivism (Piquero and Jennings 2016). 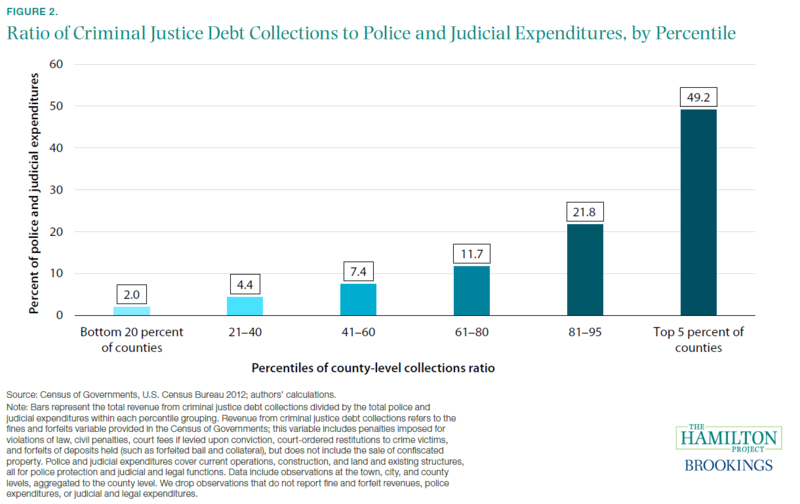 Much of the assessed criminal justice debt is never collected. Of the nearly $430 million in criminal fines and fees imposed by Florida counties in 2018, only 40 percent has been collected; in San Francisco, California, the collection rate for administrative fees has averaged 17 percent in recent years (Financial Justice Project 2018; Florida Court Clerks & Comptrollers 2018). The vast majority of collection offices cite “indigent defendants and high court costs” as reasons for the difficulty of collecting assessments (Murphy 2015). In a Hamilton Project proposal, Beth Colgan (2019) presents the evidence on how the criminal justice system burdens people with fines and fees, describes evidence from experiments on graduated sanctions, and develops proposals to help the courts take into consideration an ability to pay when they impose monetary sanctions. 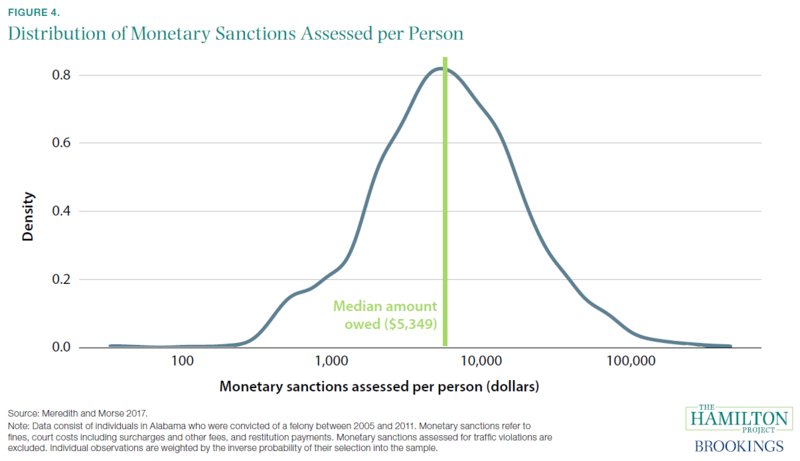 Fact 5: Monetary sanctions are used disproportionately more in cities with a higher share of black Americans. Criminal justice revenues are not collected uniformly across the country. As explained in fact 2, some jurisdictions make much more use of fees and fines than others. 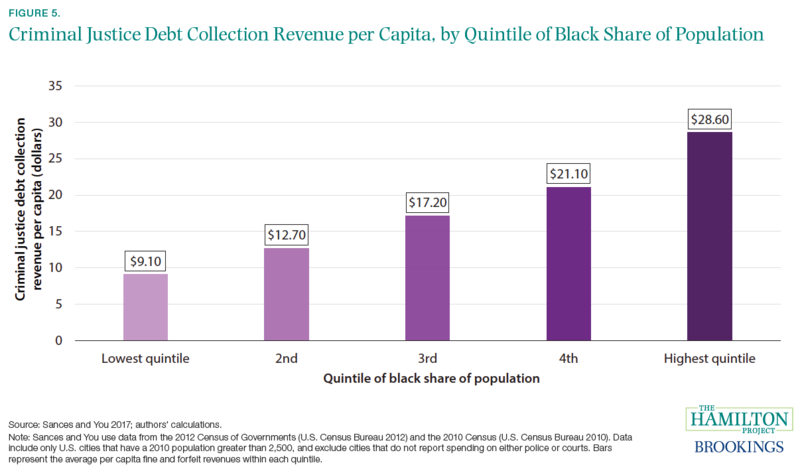 Moreover, the places that tend to collect higher revenues are those with higher shares of black residents. As shown in figure 5, cities in the highest quintile of black share of population collect roughly $29 in criminal justice revenues per resident, whereas cities in the lowest quintile collect only $9. This relationship between criminal justice revenues and the black share of population remains after controlling for a city’s local finances and demographics as well as county-level characteristics: Sances and You (2017) estimate that cities with the largest black share of residents collect between $12 and $19 more per resident than those with the smallest black share of residents. Additionally, one study finds that the arrest rates of black and Hispanic residents for drugs and DUI violations increase during periods of fiscal distress; the authors only observe these results in states where police departments are more easily able to retain revenue from seized property, and they do not find a similar relationship with respect to white arrests (Makowsky, Stratman, and Tabarrok, forthcoming). These disparities are echoed in law enforcement activity; one well-known example is the city of Ferguson, Missouri. In 2015, black residents in Ferguson made up 67 percent of the city’s population but accounted for 85 percent of its vehicle stops, 90 percent of its citations, and 93 percent of its arrests (U.S. Department of Justice 2015). Given the lower average wealth of black households (Hamilton and Darity 2017), these criminal justice penalties can become an excessive burden for many, and as noted in fact 6, can result in reincarceration. Fact 6: Criminal justice debt is a significant factor in reincarceration. Correctional supervision often continues in the form of probation or parole after any sentence is served. As a condition of continued freedom, the probation and parole systems make a variety of demands on individuals: for example, they may require drug treatment, employment, continuous reporting to an officer, and/or repayment of criminal justice debt. Failure to satisfy any of these conditions can lead to so-called technical violations and a subsequent revocation of parole or probation. 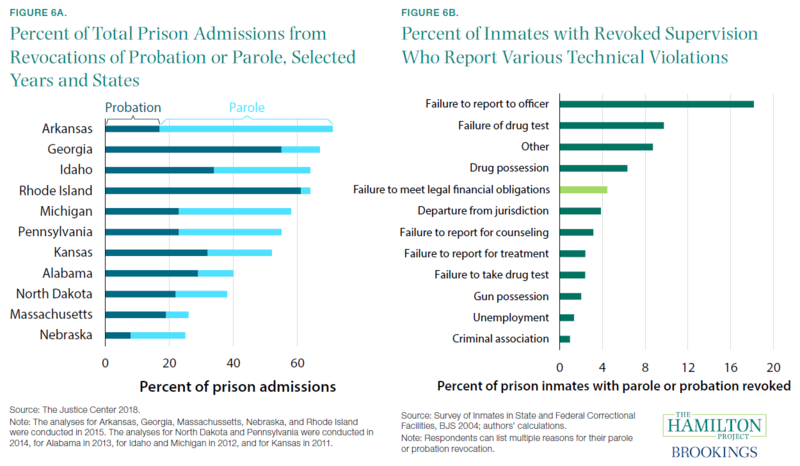 In many states, technical violations result in a large fraction of prison admissions. Using estimates from the Justice Center of the Council of State Governments (2018), figure 6a shows the percent of new admissions that result from revocation of parole or probation for selected states. Of the states in the data set, Arkansas has the highest fraction, at 71 percent, while Nebraska has the lowest, at 25 percent. 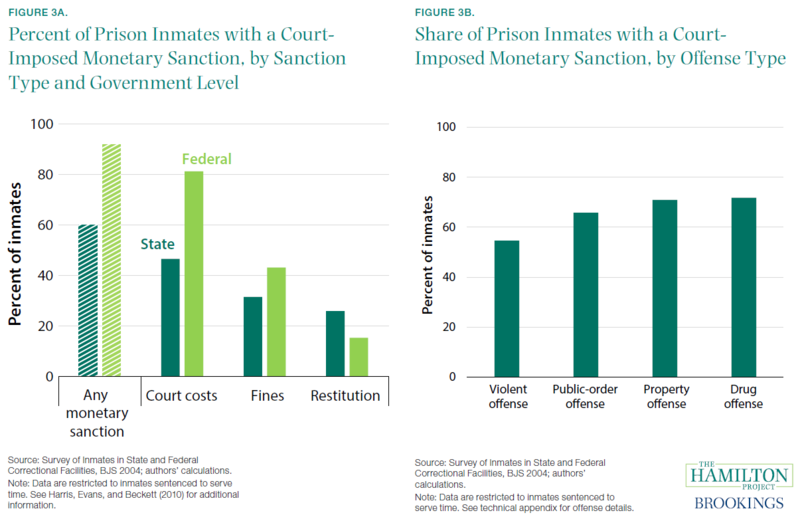 The fact that monetary sanctions from the criminal justice system result in a substantial number of reincarcerations suggests these penalties are generating important costs to society ranging from the most direct (increasing corrections costs) to those that are broader (e.g., interrupting careers and housing, disrupting families, and harming job prospects). Fact 7: Substantial quantities of assets are seized without a criminal conviction. The criminal justice system generates revenues through the seizure of assets that are believed to have been used in connection with a crime, a practice often known as civil asset forfeiture. This practice saw limited use early in U.S. history, but has dramatically expanded since Congress acted in 1984 to create the Department of Justice Assets Forfeiture Fund (Carpenter et al. 2015). Along with the Department of the Treasury Forfeiture Fund (U.S. Department of the Treasury 2018), this Fund has been the recipient of growing deposits over the years (shown in figure 7a). From 2007–17, deposits to the two funds averaged a combined $3.5 billion. 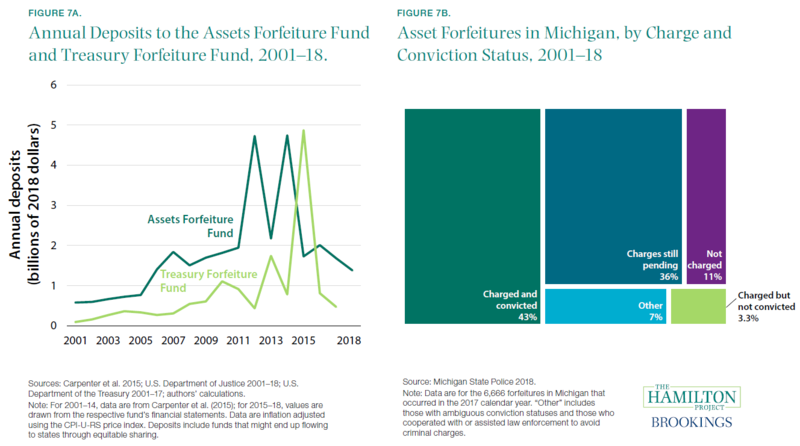 Some of these funds are ultimately remitted to states: for the Assets Forfeiture Fund, payments to states (referred to as equitable sharing) were equivalent to 29 percent of total net deposits in 2018, or around $400 million (U.S. Department of Justice 2018). Although inflows to both funds have risen over time, annual deposits can be volatile due to large civil lawsuits (Carpenter et al. 2015). However, most (89 percent) federal cash seizures by the Drug Enforcement Administration (DEA) are valued at less than $100,000. In turn, 77 percent of those seizures were accomplished through a process that does not require either an arrest or a conviction (Office of the Inspector General 2017). These estimates exclude much of state forfeiture activity, which is more difficult to observe. By one estimate, 26 states and the District of Columbia seized $254 million in assets in 2012 (Carpenter et al. 2015). Fact 8: Nearly half a million U.S. inmates on any given day have not been convicted of a crime. On a typical day in the United States, roughly 460,000 people are incarcerated but have not been convicted of any crime. In an overwhelming majority of cases, even though a judge has deemed those people to be eligible for release, they remain incarcerated because of their inability to pay the required bail (Reaves 2013). Over the past 30 years, there has been an increased reliance on monetary bail, coupled with increases in typical bail requirements (described further in fact 9). Of felony defendants, the fraction required to post bail rose from 53 percent in 1990 to 72 percent in 2009. This increase occurred in every major offense category (Liu, Nunn, and Shambaugh 2018). There has been a coincident decline in the share of defendants released on their own recognizance. A very small share (roughly 4 percent) are held without bail due to safety or flight risks. Pretrial detention—generally due to inability to pay bail—has sizable negative consequences to individuals and to society. 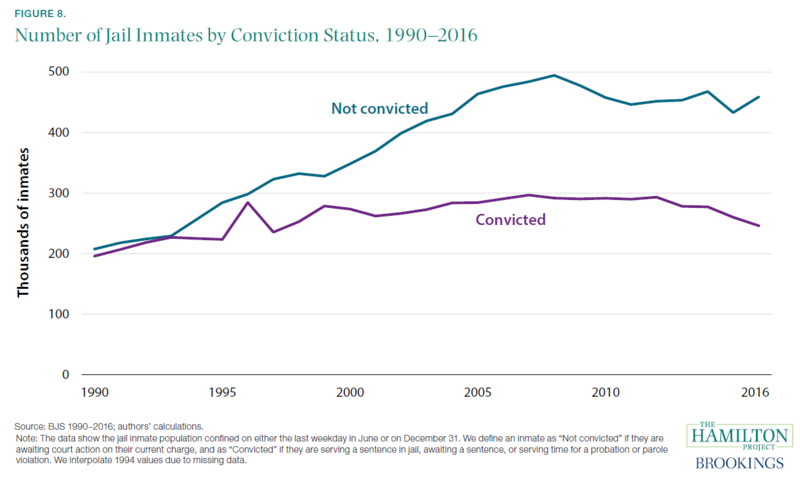 Those held before trial are far more likely to plead guilty—in many cases because it would allow them to shorten or end their time in jail—generating a criminal record and sizable negative impacts on employment over time (Dobbie, Goldin, and Yang 2018). In addition, there are direct costs of imprisonment, as well as negative impacts on families and businesses (Liu, Nunn, and Shambaugh 2018). Some jurisdictions have moved to reduce or eliminate the use of monetary bail. One study examines Philadelphia’s No-Cash-Bail reform policy, which led to a 23 percent increase in release on recognizance and an analogous decrease in the fraction of defendants who spent at least one night in jail, and found that less-frequent use of cash bail did not significantly affect failure-to-appear rates or recidivism rates (Ouss and Stevenson 2019). 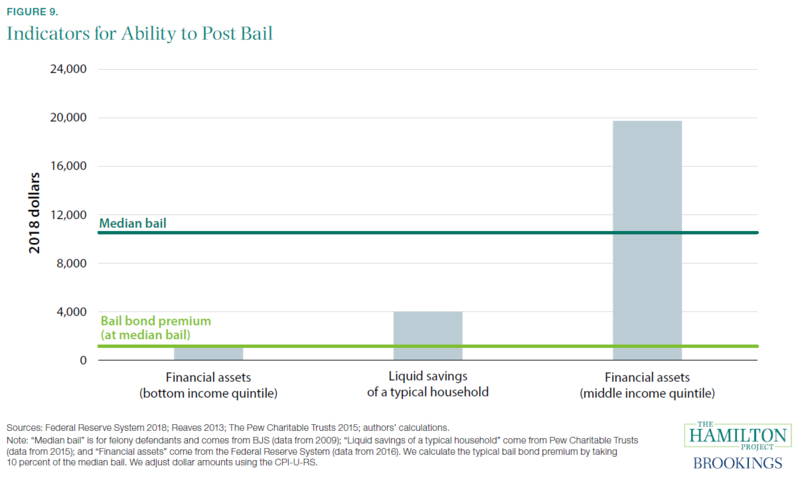 In a Hamilton Project proposal, Will Dobbie and Crystal Yang (2019) explain how the current bail system generates costs to the economy and how reforms of the bail system could improve outcomes for detainees without compromising public safety. Fact 9: Bail can be prohibitively expensive for the typical household. These figures may overestimate the ability of many households to generate cash quickly. Roughly a quarter of households do not have $400 in liquid savings (Bhutta and Dettling 2018). An even higher share of households (41 percent) would choose to borrow money, sell some of their assets, or would simply be unable to pay if faced with a $400 emergency expense, highlighting the exceedingly thin financial buffers that many Americans experience (Federal Reserve System 2018). This economic reality suggests that a range of families may face hardship when attempting to attain pretrial release. Given that an individual might stay in jail for months until adjudication, there is a large value to being released on bail, which makes many willing to endure the necessary sacrifice (Liu, Nunn, and Shambaugh 2018). The requirement that defendants post bail—and the inability of many to do so—has substantial negative effects on individuals’ economic outcomes. These effects generally take the form of an increased likelihood of conviction (Dobbie, Goldin, and Yang 2018; Leslie and Pope 2017; Lum, Ma, and Baiocchi 2017; Stevenson 2018), which then diminishes access to labor markets (The Pew Charitable Trusts 2010) and increases the probability of recidivism (Heaton, Mayson, and Stevenson 2017).